Everything is moving along towards tomorrow night's Sydney Opera House gig. There were about 100 seats (out of about 2000) left the last time I checked, and if you're thinking of coming tomorrow night you should grab a ticket fast. The Opera House had wanted a signing, but hadn't really thought through the logistics of 2000 people wanting their things scribbled on, even if only half of them wanted something signed, or the keeping on of Opera House staff to run the signing, or keeping spaces open for hours while a thousand people lined up and shuffled forward, and when they realised what was involved they very sensibly decided that no, they wouldn't have a signing on Saturday night. So I went to the Kinokuniya bookshop yesterday afternoon after the Triple J interview with The Doctor (it's up at http://www.abc.net.au/triplej/thedoctor/) and I signed 2000 books by me. Everything they had. EVERYTHING. So although there will not be a signing, anyone coming on Saturday night can get a signed book. Probably anyone in Sydney who wants anything signed by me next week will just have to go into Kinokuniya and take your choice. 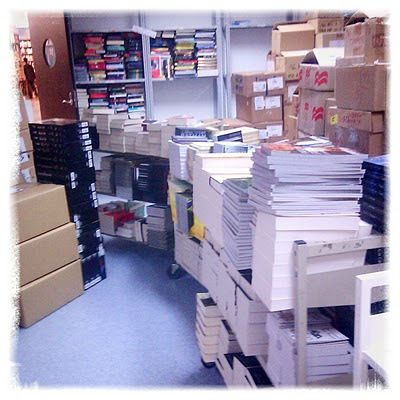 This is about 3/4 of them, when I was done (they'd already wheeled some of them away).